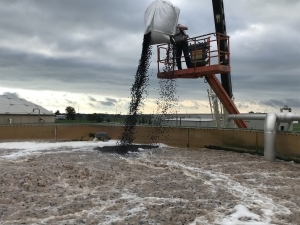 Aeration is the basis of secondary wastewater treatment, which comes after the headworks and sometimes also after a primary clarifier. Secondary treatment of most municipal and many industrial wastewaters involves a biological process. Wastewater aeration allows this biological process to work. Oxygen is usually provided by a grid of fine bubble diffusers mounted on the floor of an aeration basin. Flocks (or attached growth on media, in the case of an MBBR) of aerobic bacteria in the aeration tank consume the biodegradable waste along with the oxygen. The bacteria then convert the waste into settle-able solids. SSI manufactures fine bubble disc diffusers, tube diffusers, and complete aeration systems. We also produce coarse bubble diffusers. 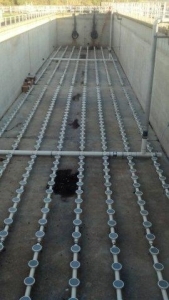 We also provide engineering, startup and installation services for the aeration systems we sell. The photographs above show fine bubble disc diffusers with PTFE coated membranes. These are installed in a fixed grid configuration. The biological process used at this plant is called conventional activated sludge. 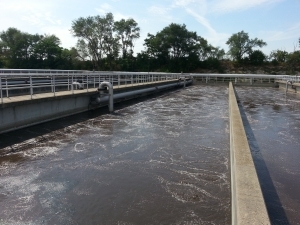 Other aerobic processes also require wastewater aeration. The photo above is an example of the moving bed bioreactor process. 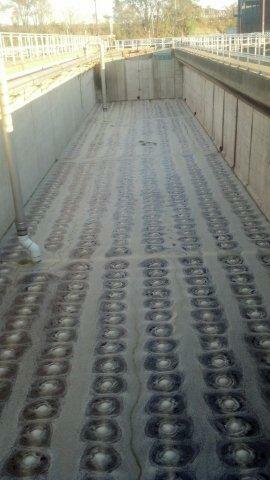 This process is also available from SSI, through our Process Division. This particular site uses coarse bubble diffusers, though there are quite a few similar plants with fine bubble diffusers.